Teaching staff at the University have successfully used electronic clickers as a way to boost interaction with their course material and pace their lectures according to the needs of their students. Dr Peter Judge (Biochemistry Department) experimented with polling devices during his first-year undergraduate Thermodynamics lectures. He wasn't disappointed. An exam question based on material where clickers had been used was the second most selected question on the paper and received the highest average mark. 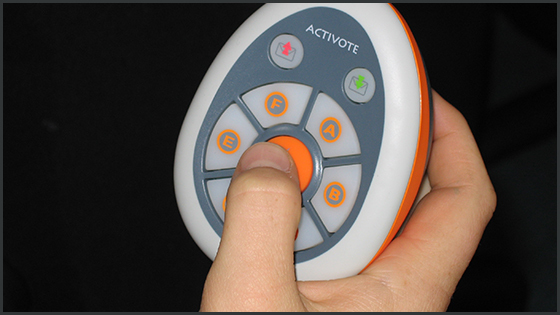 Among a variety of benefits, clickers help get students to think on their feet and approach familiar concepts in novel ways.